On the way back from visiting the garden “Interieur à Ciel Ouvert” on Sunday afternoon we passed near Radon, on the main road from Sées to Alençon (D438) in south-east Normandy. By the roadside we spotted a garden in which there was a massive statue of a horse and a couple of forged iron gazebos, and a sign post which said something about antiques; having some time to kill, we did a U-turn and went back to investigate – and we are so pleased we did! For the sign pointed the way to “Esprit Antique”, which turned out to be an architectural salvage yard on a truly massive scale. Covering 10,000m², Esprit Antique sells a bewildering range of old materials to furnish and decorate your home and garden – gates, tables, stairs, gazebos, chairs, wardrobes, fireplaces, fountains, urns, planters, wrought iron fencing, marble fireplaces, garden statuary in bronze, iron and stone, reconditioned cast iron bathtubs, terracotta floor tiles, old roof tiles – the list goes on. In addition to salvage they also sell reproduction and new wrought iron garden furniture. Some of the goods are stored in the yard – mainly garden furniture, gates and statuary – while there are three large buildings housing furniture, bathtubs, etc. Adjoining the yard is what looks like a very nice restaurant, the Restaurant d’Avoise. Esprit Antique is open 7 days a week. Thursday to Saturday: 12h00 to 14h00 and 19h30 to 22h00. 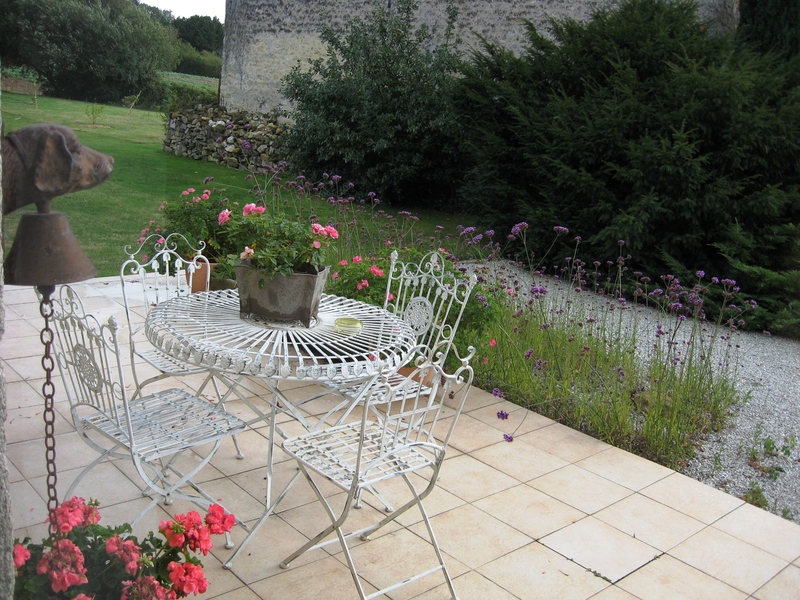 We even managed to find two chairs to complete the set on our front terrace – not an exact match, but close enough! Thanks so much for posting about this place. It really is an incredible place! Looks great, might have to take a trip out there! Well worth it, Clair – I can’t believe we hadn’t come across it before.